Should you ask her if she is an alchemist as well, she will answer, "I know how to mix a few basic potions, but I'm nowhere near as skilled as a master alchemist. I've picked up a few tricks by reading the tomes scattered all over the shop, but I don't have the knack to pull half of the formulas off. I wish Elgrim had spent more time tutoring me then that Ingun girl." You can then further ask her if she's jealous of Ingun, which she'll laugh off with "Oh! No, I didn't mean it that way. Elgrim can barely put his [sic] on his own shoes let alone have the energy to pursue a young girl." She'll continue by saying, "He's been gushing about how talented Ingun is at alchemy. He'd never say it to her face; that's not his way. I just think Elgrim's taken it upon himself to mentor the young thing so he focuses a lot of attention on her." She will be grateful once you bring her the requested ore sample, saying, "Thank you. I'll be sure to get Elgrim to examine this as soon as his... busy schedule allows." 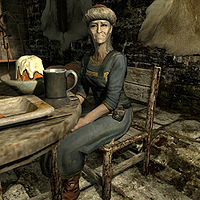 She will give you a few random potions Elgrim concocted: "Here, I had him make you a few things for all that travel." This page was last modified on 24 December 2017, at 04:52.